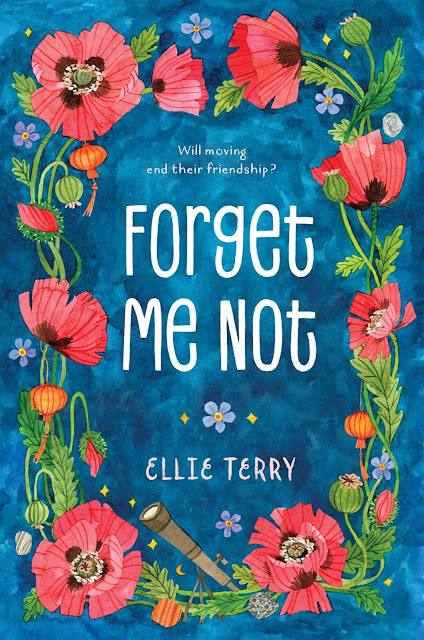 I'm so excited to help reveal the cover to Ellie Terry's debut middle grade novel-in-verse, FORGET ME NOT! Waaay back in 2014, I was a mentor for PitchWars (which, if you're not familiar with it, is a contest in which agented and published authors mentor writers who are seeking an agent). I got lots and lots of entries in my inbox, but among the ones that really stood out was a beautiful novel-in-verse from a writer named Ellie Terry. I adored the writing, but ultimately chose a different author to mentor for that contest. Luckily, another mentor (the fantastic Joy McCullough-Carranza) snatched Ellie's work up, and she got into the contest anyway. As I've found with contests like this, you develop a sense of attachment to and pride in the writers you meet through the process. 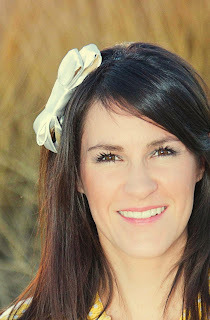 So when Ellie signed with an agent and then landed a book deal, I was so excited for her! And now, she's here on Kidliterati to share the beautiful cover for her book, FORGET ME NOT. So, enough from me. Here's what you've really been waiting for . . . the cover!! And here are Ellie's thoughts on her cover . . .
You know how some authors just KNOW exactly what they want their covers to look like from the moment they first put pen to paper? Yeah, that wasn't me. 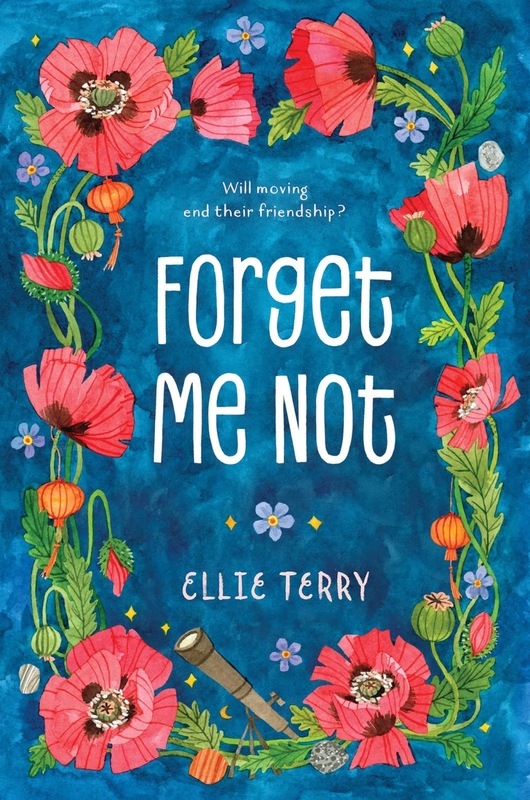 But that was okay, because my book's designer, Anna Booth, didn't need any input from me to create a beautiful cover for FORGET ME NOT! The day I received the first email with a black and white cover sketch, I was equal parts terrified and excited to open the attachment. When I did, I was . . . really surprised. Don't get me wrong. I liked it. I liked it VERY much! It was just so different than anything I had thought of (and for the record, way more gorgeous, than anything I had ever thought of). But when the full color version came in, I fell head-over-heels in love. I loved the colors. I loved the flowers and the rocks. And I felt as though I had somehow hit the book cover jackpot! Astronomy-loving Calliope June has Tourette syndrome, so she sometimes makes faces or noises that she doesn’t mean to make. When she and her mother move yet again, she tries to hide her TS. But it isn’t long before the kids at her new school realize she's different. Only Calli’s neighbor, who is also the popular student body president, sees her as she truly is—an interesting person and a good friend. But is he brave enough to take their friendship public? As Calli navigates middle school, she must also face her mother's new relationship and the fact that they might be moving—again—just as she starts to make friends and finally accept her differences. Ellie Terry writes about things that hurt her heart. She is a poet, writer, and reader who is also diagnosed with Tourette syndrome. She enjoys picking flowers and baking brownies, and has a slight obsession with the moon. Her debut novel, FORGET ME NOT, will be published March 14, 2017 by Feiwel & Friends, an imprint of Macmillan. You can visit her website, say hi to her on Twitter, and like her Facebook page. And don't forget to add FORGET ME NOT to your Goodreads' to-read list! For more fun, check out Ellie's journey from Pitch Wars to published author here, and see her original Pitch Wars entry here! Ellie, it's A W E S O M E !! love it so much. Congrats! LOVE LOVE LOVE LOVE LOVE LOVE LOVE LOVE LOVE LOVE LOVE LOVE LOVE LOVE LOVE LOVE LOVE LOVE LOVE LOVE LOVE LOVE LOVE LOVE LOVE LOVE LOVE LOVE LOVE LOVE LOVE LOVE LOVE LOVE LOVE LOVE LOVE LOVE LOVE LOVE LOVE LOVE LOVE LOVE LOVE LOVE LOVE LOVE LOVE LOVE LOVE LOVE LOVE LOVE LOVE LOVE! I love this cover and I can't wait to read the book! Love the poppies and the rocks! It's perfect! Thanks, Myrna! It is perfect, isn't it? It's beautiful. And brings to mind your original, original title. ;) Pocketful of Posies, it is! Congratulations. Can't wait to purchase my own hardbound copy. Thank you, Gayle! Yes, the title has changed a few times, but the poppies in the story haven't! I was so pleased that they included poppies on the cover. Elliah, It's beautiful!! I love love it. Can't wait to read the book!!! I agree! I love it, too.